OVERVIEW: See one of the screen’s biggest action-adventure epics like never before – on Blu-ray™ Hi-Def! October 20 from Universal Studios Home Entertainment. Set in the future when Earth is completely covered in water and the human race is struggling to survive, mankind’s one remaining hope for a better future is a drifter (Kevin Costner) who gets caught up in a battle between the evil Deacon (Dennis Hopper) and a child’s secret key to a wondrous place called “Dryland.” Featuring groundbreaking special effects, Waterworld is a visually stunning, futuristic thriller beyond your wildest imagination! BLU-RAY: The film is presented in 1080P widescreen with a 1.85:1 aspect ratio preserving the film's theatrical format. It seems to be the same cut use in previous HD DVD released. Picture with non obvious color saturation. Universal Home Entertainment has done it again with this transfer. Not only the picture looks excellent in this release, also the sound it is good, a 5.1 Dolby DTS-HD in English that provides a nice complement to the picture. It also includes 5.1 Dolby Digital language tracks in several languages including Spanish and Francais, as well as multi language subtitles. In terms of Special Features, the Blu-ray Disc includes only the trailer and BD Live. 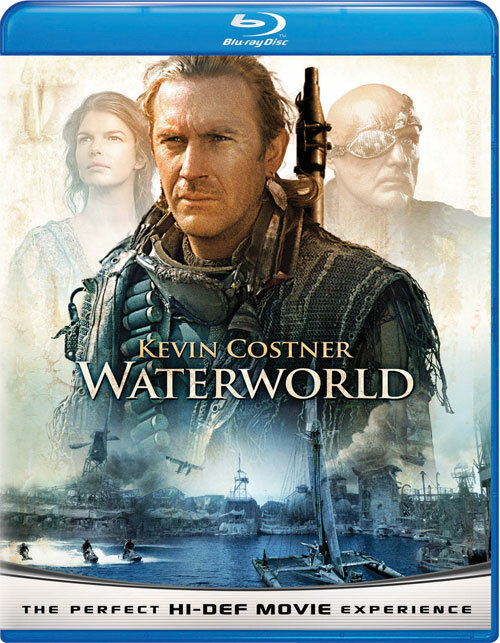 This is a Blu-ray to own for Kevin Costner's fans, other than that is a good rental. Overall the Blu-ray looks great and is better appreciated in high definition.